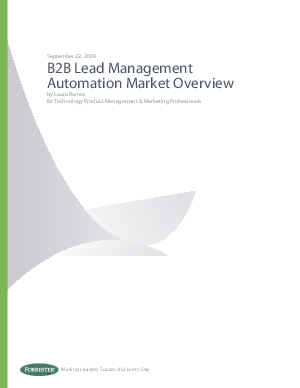 > Marketo > B2B Lead Management Automation Overview, a paper by Forrester Research Inc.
Lead management automation (LMA) requires a degree of process maturity many business-to-business(B2B) firms don’t possess, resulting in underachievement by vendors and users alike. Yet, the benefitsof adopting LMA are clear: B2B marketers that successfully carry out lead management practices enjoymore predictable conversions, faster sales cycles, and real alignment between marketing activity andsales results. While leading vendors like Eloqua, Marketo, and Silverpop drive results through improvedmarketing and sales productivity, no technology supplier is yet in a breakaway position. As the marketstrives to reach maturity, B2B marketers should pick partners that can help mature their processes, aswell as come up with innovation and easy-to-use features.